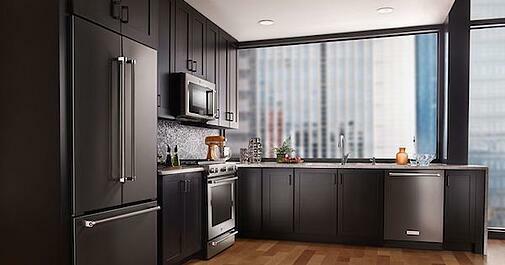 Black stainless steel appliances are here and they are hot! But are they right for you? Are you considering a new kitchen package and leaning toward stainless steel but wondering whether you should choose black stainless steel instead? We can shed some light on this choice for you. As an appliance dealer for over 60 years, we have seen many color trends come and go. We are certainly familiar with these tough choices about color that consumers face when looking at new appliances. Most consumers who are going to switch colors usually do it in conjunction with an entire kitchen remodel and the purchase of a multi-piece package. Others replace appliances one or two at a time along the way as they wear out. Either way, the choice to convert over to a trendy new option like black stainless is always a difficult one. Let's take a little closer look at black stainless and see how it compares to traditional stainless steel. We'll try to help you decide whether it is right for you. Which manufacturers produce black stainless steel? The finish is naturally fingerprint resistant, partly because the darker color naturally hides fingerprints better, but manufacturers have taken different steps in how they market this feature or improved it. The easiest way to find out what brands have a more fingerprint resistant finish is to check them out in person and test them yourself! Check out our video for a quick visual comparison of black stainless finishes and styling from different brands! Bosch's products are the most recently released. We noted at a trade show in 2018 that they are very different from the other black stainless products out there. The metal has a unique horizontal grain to it that gives it texture, depth and a shine with a subtle sparkle. Additionally, the finish is extra durable because the black color is baked into the stainless steel in the manufacturing process, rather than applied on top of stainless steel as a coating. The unique look of black stainless provides an opportunity for you to do something different in your kitchen but still keep the clean professional stainless steel look that you're shooting for. Each manufacturer's black stainless steel finish is a little different so you'll want to see them for yourself. If you are going to go with black stainless steel, you will most likely want to stay within the same brand to match the finishes. Based on our observations and discussion with our customers, here are some of the top pros and cons to consider when looking at black stainless steel appliances. Black stainless steel is new and hot, giving you a cutting edge look and allowing your kitchen to stand out from most other kitchens that you see. The finish is less prone to smudges and fingerprints than traditional stainless steel - although some manufacturers offer fingerprint resistant black stainless as a default, while others do not. Cleaning is generally simple and can be accomplished using warm water and a soft cloth. Simply wipe dry when complete to finish it up. Black stainless steel appliances pair beautifully with today's hottest kitchen cabinetry colors, white and light gray. The trend of black stainless steel appliances is unproven. If the products don't sell well, manufacturers may discontinue the color option, making it difficult for consumers that buy a package now to replace a malfunctioning piece a few years down the line. While this finish is less prone to smudges and fingerprints, it may be more prone to scratches and chips. This may vary by manufacturer as each of their processes is a bit different. The jury is out on on this one. The most scratch-resistant brands seem to be Samsung and Bosch although we have gotten some feedback about peeling and other issues with Samsung in the comments section below. The overall color itself and the finish (from ultra-glossy to a highly brushed satin glow) varies a lot in black stainless from one manufacturer to the other, so mixing and matching products from different brands to make a kitchen package may be a challenge. Should you buy black stainless steel appliances? If you want to be on the cutting edge you should probably opt for a full kitchen of black stainless steel appliances and not get too concerned about some of the cons on the list above. If you are doing a new kitchen with white or light gray cabinets, black stainless is probably a no-brainer aesthetically! If you are the more conservative type, you might opt to go with traditional stainless steel and consider going with black stainless for your next set of appliances a few years down the line if the color has been proven and accepted by the marketplace. We think this color is getting more popular and likely has a foothold in the market, but it's still not conclusive if this finish will stick around. So far it seems to have sustained longer than other fad finishes from the early 2000s, like Jenn Air Oiled Bronze! Are you on the fence and seeking another color option but black stainless isn't appealing to you? Read our article about black slate appliances, or check out our overview and comparison of other hot new appliance styles on the market like slate and black matte! There are a surprising number of new alternatives to stainless steel that will give your kitchen a premium look. NOTE: There is a lot of feedback in the comments section below that is worth reading if you are very interested in this new color option and want opinions from other consumers. Click here to search by brand and color to view all Black Stainless Steel models! We hope you enjoyed this discussion of this hot new trend in appliance colors. Let us know which of the brands looks most appealing to you, and if you have any firsthand experience with black stainless appliances. Leave us a comment below in the comments section - We'd love to hear from you! Editor's Note: This blog was originally published in February of 2017 and has been completely revamped and updated for accuracy as of the publication date noted above.